No purchase necessary. Void where prohibited by law. Contest dates 11/1/18 – 5/31/19 . First drawing to be held on 11/1/18. 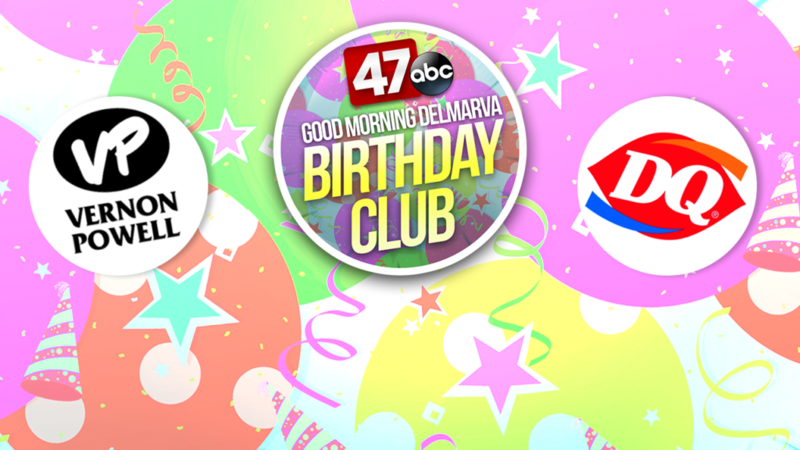 Each day Monday through Friday during Good Morning Delmarva (5am-7am) entrants having a birthday on that day will be recognized with a Birthday Club graphic showing name. One of these entrants will be selected by random drawing to be that day’s Birthday Club winner. Those with Saturday and Sunday birthdays will be listed on the Friday Birthdays graphic and will be included in the random drawing for the Friday winner. The winner’s name will be announced during Good Morning Delmarva and will be listed on the Birthday Club contest page of 47abc.com. The daily winner will receive a prize package consisting of: $10 gift card from Dairy Queen, plus a $25 gift card from Vernon Powell. No substitutions or cash equivalents allowed. To register, visit the 47ABC.com contest page, or send your name, address, date of birth and phone number or e-mail address on a 3”x5” postcard to: Good Morning Delmarva Birthday Club, PO Box 4009, Salisbury, MD 21803. Entries are limited to one entry per person. The daily prize package will be sent via USPS to the winner. By registering to win you release Marquee Broadcasting, Inc. and its subsidiaries to use your name and likeness for promotional purposes. By participating in this contest you agree to abide by these rules, and shall not hold liable Marquee Broadcasting, Inc. or sponsors for any injury, accident, illness, death, delay or inconvenience that may be associated with acceptance of the prize. All submissions become the property of Marquee Broadcasting, Inc. Marquee Broadcasting, Inc. and all participating sponsors, their agencies and parent companies are not responsible for lost or missing entries, or for prize packages lost by USPS. Employees of Marquee Broadcasting, Inc., Dairy Queen International and Vernon Powell are not eligible to win.